We submit our visa application to the French Consulate in Andorra (the last place we lived). It’s September, 2004 and we are 4 months into the 2-month process (there was July and August in there – when nothing is done…summer holidays, you know). The French Consulate says we must come in person for an interview. Fine, I could always do with some shopping. They didn't actually need to talk to us; they just needed us to give them the '90 euros each' processing fee. Fifteen days later, they said: Who told you such a silly thing, it's always two months. Everything in France takes two months. So we wait two months. I sent a fax asking the status. I am told it is ‘en cours’ (in process). Another month goes by…another fax….another reply ‘en cours’. It’s January, 9 months into the process. I send an e-mail as well as a fax asking the status. Hmmmmm this could be a problem…. I gathered up copies of everything and faxed it off. ‘We’ll look into it immediately’ was the response. Now, for some reason, I have their attention. It seems the file was ‘misplaced in the Paris office’ somehow but they (the Andorran people) would follow up closely. I start to receive status e-mails every other day informing me that, while they still do not have the visas, they are monitoring the progress through the paperwork maize. In the beginning of February, we finally receive the joyous news: our visas will, in fact, be issued on the 14th of February and we may come by the consulate to collect them on the 15th. And try this lovely soup while you wait…. Well, it tastes delicious…. Chop shallot. Drain and rinse beans. Heat oil in medium sauce pan over medium heat. Add shallot and sauté until transparent. Add beans, chicken stock and thyme, cover and simmer 10 minutes. Remove 1/4 cup of chicken stock and puree the rest, either in blender or with wand blender. Check for consistency, add as much of the removed stock as you like (or more) to get desired consistency. This is a personal thing, mon mari likes soup very thick, my mother very thin…. Reheat if needed. To serve: Ladle soup into bowls. 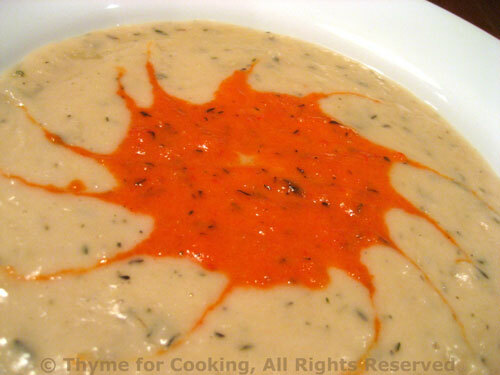 Carefully drizzle 2 tbs of Red Pepper Coulis in a pattern or all in the center and use a warm knife to draw a pattern. It should float on top of the soup. Serve. Clean pepper and cut into big pieces. Sauté shallot in olive oil in a small saucepan until tender. Add pepper chunks, thyme and chicken stock. Cover, reduce heat and simmer until pepper is very tender, about 20 minutes. Remove from heat and puree, using as much chicken stock as needed to make a thick sauce. Add tomato paste and mix well. Use 4 tbs for the soup. 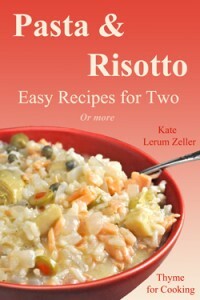 If you have Red Pepper Coulis left – stir it into risotto, mashed potatoes, hummus…. Katie – you both have the patience of saints! Well, I guess you have to – looks like there was no other choice. That soup sounds so good, and how pretty too. What patience you have! I hope you’re having safe travels, and I love white beans. I have a lot in my freezer so perhaps I can make this soup easily. Tse-Sung Wu, thank you – hope you try and like the soup. I never think of freezing beans – must do that this winter. daphne, I love hot, creamy soups in cold weather! How did I miss this (very pretty) soup? And with red pepper coulis no less. I always love reading about your trials and tribulations with French bureaucracy, no matter how far in the past.